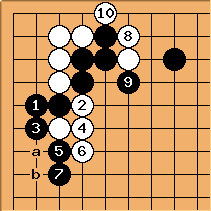 Few variations are possible to the basic joseki after . After AlphaGo, the choice of over a became the gold standard. 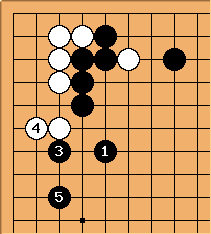 The advantage is that White now cannot play at , either to connect her stone or cut off Black's wall from the rest of his position on the top, and the hane-connect of White b is not sente in the yose. The disadvantage of course is the possibility of the white cut at a. 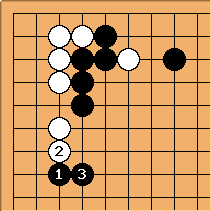 If Black intercepts at , the joseki to can be expected. White makes decent territory, but is blighted. After this, Black has several choices. Among professionals, playing tenuki now seems to be the most common. If White gets to play here next, a is the most likely spot. With , Black extends his influence. After this, White normally answers at . This may seem like a lukewarm move, but actually it is honte. Any other way of defending leaves too much aji for Black to aim at. 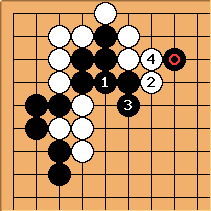 In fact after this solid defence black's influence is rather thin and white has various reductions and other follow-ups to aim at, such as a-d (note that black e is no longer sente), whilst white has solid profit on the left side; so black should be sure this exchange actually benefits him or can end up being a thank-you move. If White does not answer , Black will make the profitable exchange of for . 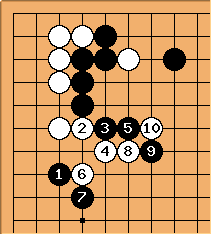 It is painful for White to allow Black this exchange in sente, but still it is playable - the sequence here was played by Cho Chikun (Black) against Kobayashi Koichi in the 1999 Kisei title match. The tsume of is rarely played immediately. Nevertheless, it is a common manoeuvre for Black, as a follow-up. 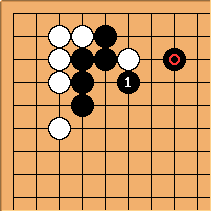 After and , White has sente, but Black has confined her to the corner, and now has strength on both sides and towards the center. The alternative for White is to run into the center with and . Black patches up his shape with . The continuation to is one possibility. 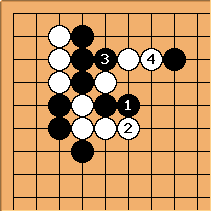 White has set her sights on the stones, but makes black thick in the center. is not a good move with the one-space low pincer. The stone is now too close to Black's wall. There are two ways for White to punish it. The first is by the simple hane and connection of and , followed by the clamp-tesuji of . If Black draws back at , White connects at . 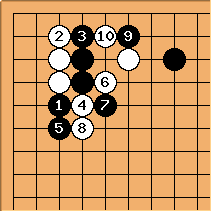 Compared to the normal joseki, Black has made the extra exchange of for - which is clearly aji keshi. If Black tries to resist with , White cuts at . One possible follow-up is shown. If Black does not play at (but for example at ), White wins the semeai after White at -Black a - White b. Black has been forced into a clumsy shape, while has been cut off and blighted. The four white stones are far from captured yet. The second possible answer to is . If Black connects at , White connects underneath at and is satisfied with her corner area. However, if Black descends to , White fearlessly cuts at . 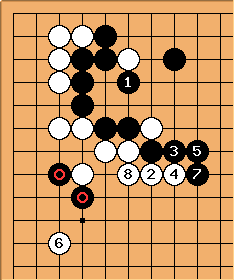 If Black tries to save his stone on the left with , White goes after the three black stones with . yet is an excellent tesuji. After this move, black is going to get a bad result. A less common variation is at 4-4 point one-space low pincer invasion, interception, hane underneath - click on . See also the discussion and forum for some of the complexities involved.